This week, another veggie burger. 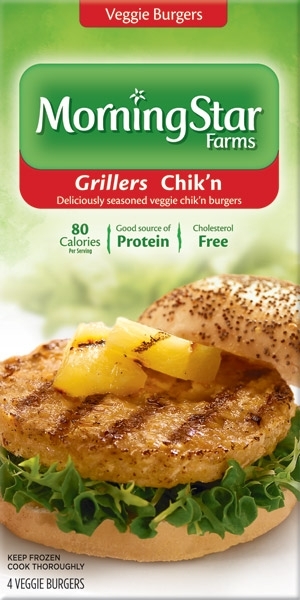 Let's take a gander at Morningstar Grillers Chik'n. The website brags that these are "grillable, tender, juicy and delicious no matter how you dress them up." Big promises and very optimistic - just how I like it. But will it measure up? Once again, regular veggie burger protocol: oil, pan, flip until hot. And again, I observed the grill marks only painted on one side. Where's the commitment, people? I know you only need to show one side on the box, but really - your customers are going to see both sides. These things make a difference. To me, anyway. So let's get to the eating. I'm sure they are grillable, even though I pan-fried it, but they were certainly not tender and juicy. The burger I ate was dry and of a texture somewhere between flaky and crumbly. It fell apart in an unpleasant way in my mouth - let's put it that way. I can sometimes overlook a bad texture if the flavor is good, but in this case, the flavor was not good enough to overcome the texture problems. It's hard to explain - it wasn't an interesting flavor - it was boring and weird. I tried adding ketchup (to dress it up!) and it didn't help. I tried adding salsa, which covered the weird flavor but that's not necessarily an improvement. Overall, I would not recommend these burgers. I've had way better chicken patty-type things. This week, another veggie burger. 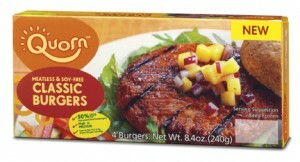 I've already tested the cheeseburger version of this, but this week, I'm testing out Quorn's Classic Burger. I hit up my usual burger routine - little oil, flip a couple times, cook until hot. Then I dug in. First thing I notice was actually while cooking - these burgers painted the grill marks only on one side of the burger. I was oddly troubled by this - if you're going to pretend, why not go all the way? But anyway, how did it taste? Well, not awesome. It was mildly oniony, which changed to a more generically meaty flavor with some ketchup. It had an oddly spicy effect - there was a sort of tingling in my mouth, despite not actually containing any spicy ingredients. I thought this was strange and a little disconcerting. Texture-wise, it was fine - not mushy or overly chewy - right in the middle. It was a texture that could not possibly offend anybody. And that is all I have to say about that. 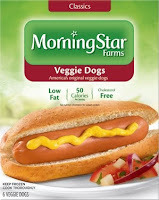 This week, I'm finally testing out Morningstar Veggie Dogs. They were very popular a long time ago but disappeared, and now they are back, apparently. Will they be able to beat the current best fake meat hot dog? Let's find out! To start out, the directions on the box had two suggested cooking methods. I decided, for science, to try them both. So I started boiling a pot of water, and while I waited for that, I tossed a dog into the microwave. Fifty seconds later, I had a piping hot veggie dog. About fifteen seconds before it was done, I was pretty excited, because a legitimately tasty smell was emanating from the microwave, but only for a second, then it turned weird, and I started to get nervous. As part of the quirkiness of microwave cooking, the skin on the veggie dog kind of bubbled up in a couple spots, making it look less than appetizing, but I cut it some slack. I cut off a chunk and popped it into my mouth. Not great. Doused a second bite in lots of ketchup and ate that - much improved, until the ketchup dissipated, and then I was left with this really funky flavor. 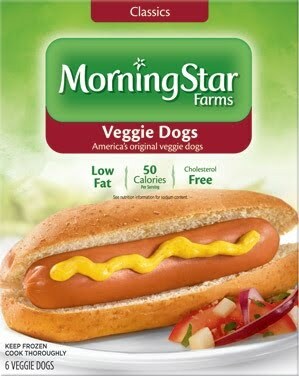 The flavor though… I even tried it with a bite of bun and a bunch of ketchup - even more improved, until the bun and ketchup disappeared, leaving only the veggie dog flavor. I will say, though, that the texture was awesome. They nailed the texture of cheap real-meat hot dogs. So by this point, my pot of water was boiling. I dropped a second veggie dog into it and noticed that I would have to keep waiting another seven minutes. What? This method is not for the super hungry or impatient. I was really hoping that it would be worth it. Seven interminable minutes later, I fished my veggie dog out of the water and dropped it onto a plate. I will definitely say that it looked a lot better than the microwaved one. But did it taste better? Heck yes it did! It was still a little weird, but a much milder weird - one that was covered up more thoroughly with a hefty dose of ketchup, and less unpleasant once the ketchup disappeared. And after a couple bites, I kind of didn't mind it too much. It's not even close to a replacement for my favorite real-meat hot dog, but of all the gluten-based veggie dogs I've tried, this one was definitely the best. Texture - exactly like a real-meat (cheap) hot dog - nailed it! Flavor - a little weird, but much better not from the microwave - use lots of condiments!